There’s a lot of digging and bridging going on at Rogers Creek in Port Alberni. 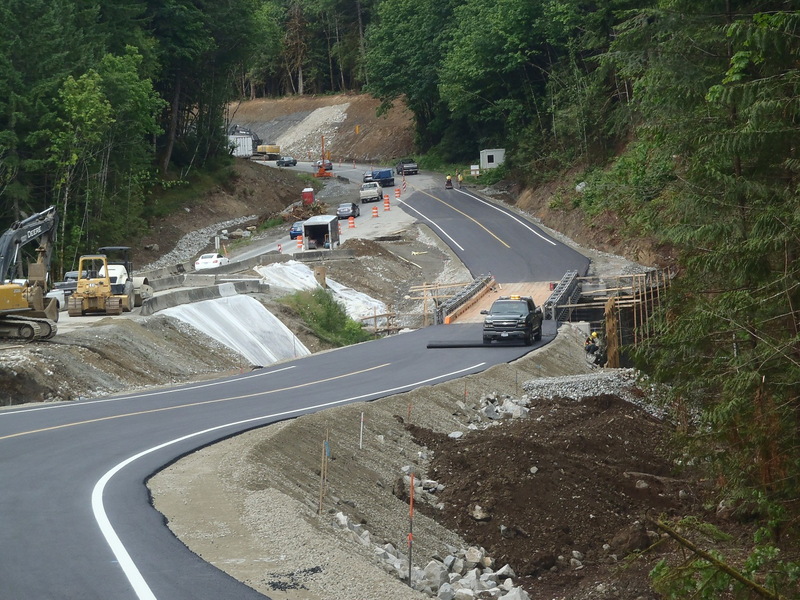 The ministry is replacing the culvert, which runs under the Port Alberni Highway, with a 44-metre-long single span steel girder bridge. The bridge will provide a wider opening for Rogers Creek to pass through. Why wasn’t the culvert good enough? It was relatively small in comparison to some of the logging debris that builds up. In fact, during a 2006 storm, emergency crews needed to respond quickly to clear heavy logging debris before potentially triggering a series of damaging events. “That logging debris, if it plugged the culvert, would turn this road into a dam,” says project manager Allan Galambos. “That dam, if it then broke, would cause a lot of damage to the city of Port Alberni, which is just downstream.”With the local hospital nearby, it’s important to keep traffic flowing while crews remove the culvert and install the bridge. That’s why contractor Neelco Builders Ltd. recently installed a temporary detour bridge to allow vehicles to pass next to the construction site. TranBC visited the site last month while the temporary bridge was being installed, piece by piece, and collected some video footage to help explain what’s going on to travellers. Take a look. And if you do drive through during construction, please watch for workers and traffic controllers. Construction is expected to be completed by fall 2014. Are there plans for a separate walking bridge to reconnect to the Frank Connector? There appears to be no dedicated and safe pedestrian walkway. We use this as a part of our weekly walking path the year around. I’m connecting with the project manager about this. I’ll keep you posted. Hi again, Terry. The existing bridge design, with 1.5-metre shoulders, was planned with input from the City of Port Alberni, and incorporates a safe passage for cyclists and pedestrians. At the request of the city, the ministry constructed a 3-metre-wide path under the bridge at the west abutment, which allows pedestrians and cyclists to pass under the structure without going up onto the highway. Meanwhile, people crossing the creek via Frank’s Connector will come off the trail, up onto the road, over the bridge on the 1.5-metre shoulder, then back down onto the trail again. Hello, I too as well as my dog and many friends and family frequent this trail usually on a daily basis, and had been patiently waiting for the replacement of the culvert and curious on how it would effect the trail and crossing of Rogers Creek. We decided to hike the trail this weekend and found it so saddening that foot passengers were really not considered in the final completion. The trail that was once there over the culvert is there no more, so we had to practically risk our lives crossing the bridge, the first vehicle we met was a huge Semi truck pulling 3 loads of lumber! Is there any future plans in the works for hikers/dog walkers or visitors that come from all over the island that love to park there car at the Redford extension and walk this beautiful trail and not have to cross the highway bridge? Hi Leeann. I relayed your concern to the area bridge manager. While the 1.5-metre shoulders are designed for the safe passage of pedestrians and cyclists, the municipality may be able to offer more information about the possibility of a future trail crossing. We’re working on getting you a contact. Please stay tuned. I think you are doing a great job, keep up the good work. Looking forward to the completion thou. Thanks for the feedback Eric. Much appreciated!